Lady Gaga’s engagement ring has been sweeping the news for the past while, and for good reason. This $400,000 beauty features all of the perfect details guaranteed to turn heads across social media as well as in person. 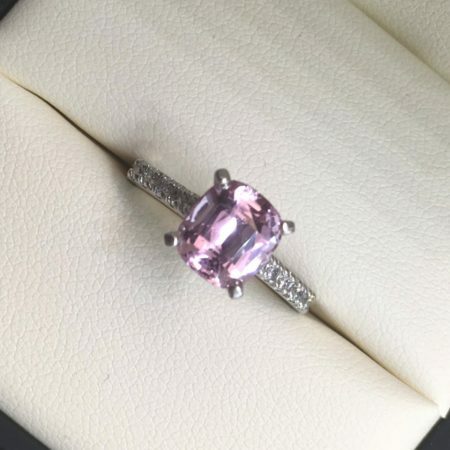 From it’s large pink sapphire to the brilliant diamond halo, this ring is surely guaranteed to top the list for this years top celebrity engagement rings. Although neither Lady Gaga nor her fiance, Christian Carino have revealed the jeweller behind the creation of their engagement ring, gem experts have been able to figure out a few of the details behind this special design. Similar to Kate Middleton’s engagement ring, it features a large sapphire in the centre surrounded by a floral halo of beautiful diamonds. The halo appears to be made in white gold while the band is yellow gold, creating a beautiful colour contrast. This style combination combination manages to make use of some of the most popular design features at the moment. As often mentioned, sapphire engagement rings are of of the most popular styles of non-diamond engagement rings. Rings featuring diamond halos are also one of our most requested designs as well. In recent months we have noticed many couples requesting that we incorporate two colours of gold into their rings. To learn more about this design technique check our our latest blog on rose and white gold engagement rings. Now lets take a look at how you can use the different aspects of Lady Gaga’s engagement ring in your own design by taking you through some previous custom rings that we have created for our clients. Sapphires are a perfect choice for a unique, non-diamond engagement ring as they are incredibly hard and durable. This means that they will wear very well over time. The above design features a beautiful natural pink sapphire set in a simple yet elegant, side stone engagement ring design. As one of the top sources for diamonds and sapphires in Winnipeg, we are the perfect avenue for those wishing to create a unique custom sapphire ring for their loved one. As mentioned earlier, one of the most eye catching features of Lady Gaga’s engagement ring is its beautiful floral halo. 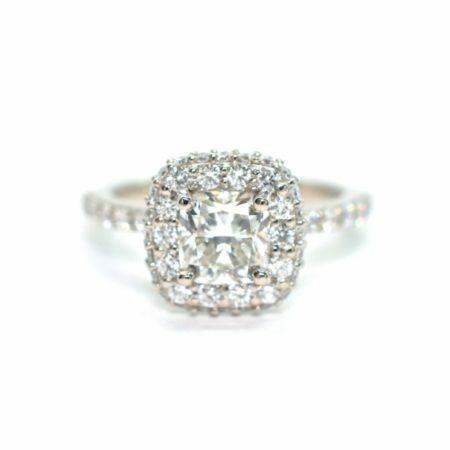 This is a style of setting that has been seen for many years and is often a main feature in both antique and vintage engagement rings. 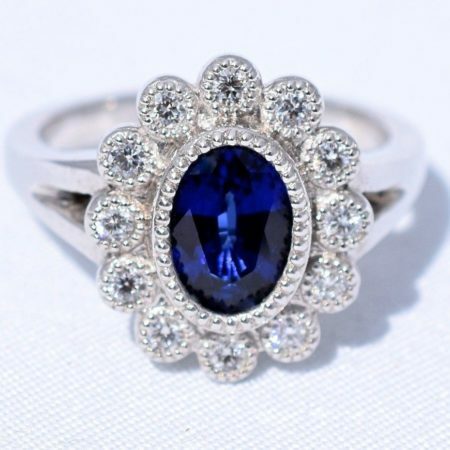 The above design features a blue sapphire set in a diamond floral halo setting and is also quite similar to the Kate Middleton ring. Perhaps one of the most similar designs to Lady Gaga’s engagement ring, this ruby engagement ring features a unique diamond halo made in white gold as well as a stunning yellow gold band. 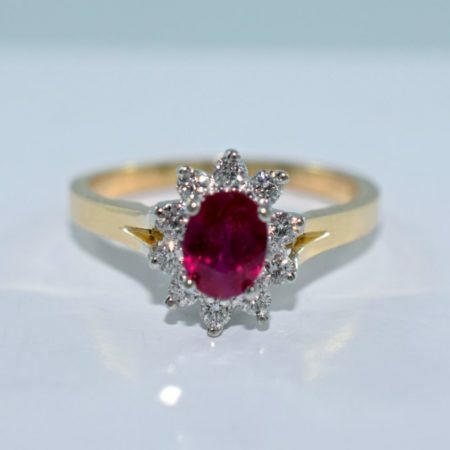 Rubies, like Sapphires belong to the same mineral family called corundum and are also exceptionally hard and excellent choices for both engagement and wedding rings. With halo rings being perhaps the number one most popular diamond ring style, we had to show you this beautiful custom cushion cut engagement ring that we created this summer. This ring features a large cushion cut diamond surrounded by a delicate and modern halo and pavé band. Like many halo rings, this particular ring quickly earned its spot as one of our most popular engagement rings on instagram. Thanks very much for reading this article on designs like Lady Gaga’s engagement ring. We hope you enjoyed learning about the different design combinations that are featured in her ring and finding out how you can incorporate these elements into your own piece of custom jewellery. Be sure to check our our engagement rings and custom jewellery pages for more design inspiration as well as view our design videos to get a behind the scenes look into what goes into creating an Omori design!